I have been teaching my toddler about animals lately. So I thought why not share these precious information on my blog to know more about our planet earth and teach our children to appreciate it and save it. 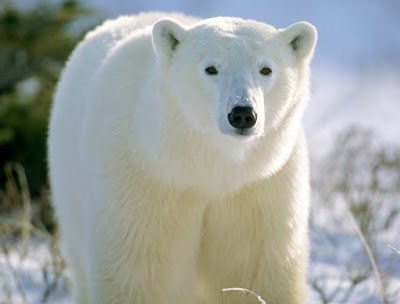 It started by the polar bear (also known as Ursus maritimus. Sea Bear. Ice Bear. White bear). Ursus maritimus is the scientific name. It means 'maritime bear' in Latin language due to the animal's native habitat. I have liked this animal since I was a child. But what I have learned is so much more than this pretty look. 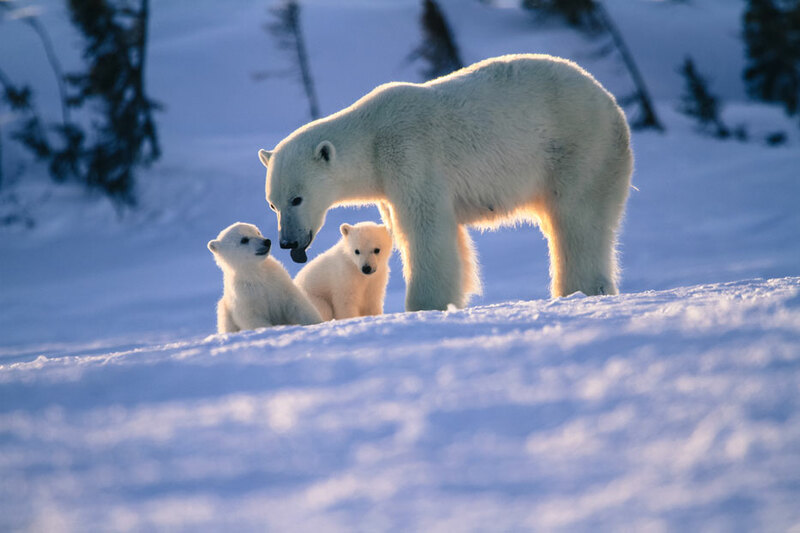 And the first interesting information that I have learned is, although children's books often show polar bears and penguins together, the two live at opposite poles. 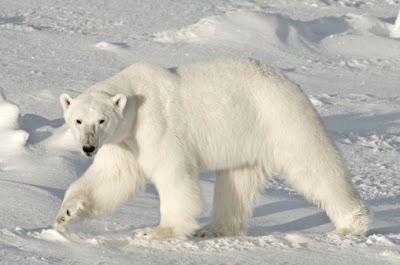 Polar bears live in the Arctic (North), a massive frozen sea surrounded by continents. Penguins live in Antarctica (South), an ice-covered continent surrounded by oceans. 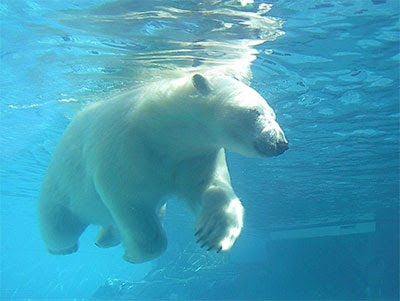 Polar bears are well-adapted to a life on the sea ice and Arctic weather that can be fiercely cold. In the High Arctic, the sun sets in October and doesn't rise again until late February. Winter temperatures can plunge to -40° or -50° F and stay that way for days or weeks. Their two layers of fur and a thick layer of body fat provide polar bears with such excellent insulation that their body temperature and metabolic rate won't change even when temperatures reach -34º F. Compact ears and a small tail also help prevent heat loss. A polar bear's body temperature is 98.6º F—average for mammals. However, Polar bears have more problems with overheating than they do with cold. That's why they typically walk at a leisurely pace. They can quickly overheat when they run. To build her den, the female excavates a small snow cave—just large enough for her to turn around. She then waits for the snow to close the entrance tunnel. In most of the Arctic, pregnant females dig maternity dens in fall and give birth to cubs in early winter. She gives birth to one, two, or three cubs in November or December. Twins are most common. Until March or April when the cubs are strong enough to survive outside and ready to make the trek to the sea ice to emerge from the den, mother and cubs spend much of their time sleeping. During this time, they live off their fat reserves. The polar bear's main prey is the ringed seal. Polar bears usually hunt ringed seals by waiting for them to breathe at openings in the ice or at breathing holes. Polar bears will also stalk seals that are hauled out on top of the ice. Polar bears locate breathing holes with their powerful sense of smell and lie in wait for the seals to rise. Polar bears have to be smart and patient because the wait can be long—from hours to days. Polar bears' lives are a cycle of feasting and fasting. 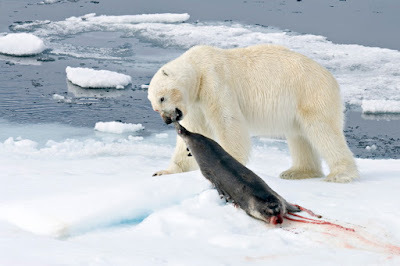 When hunting is good and a polar bear is in good body condition, the bear will eat only the seal's blubber and skin. Scientists have found that when polar bears dine exclusively on seal fat, their cholesterol levels drop lower than those of fasting bears likely due to the protective quality of the omega-3 fatty acids found in the seals. Polar bears like to be clean and dry because matted, dirty, and wet fur is a poor insulator. In summer, if the bears find something to eat, they feed for 20–30 minutes and then head for open water and spend up to 15 minutes washing off. They also lick their paws, chests, and muzzles. They dry themselves by shaking off excess water and by rubbing their fur in the snow. In winter, polar bears clean themselves with snow. They rub their heads in the snow, push forward on their tummies, and roll on their backs. Mother polar bears lick their cubs to keep them clean. Cubs also lick themselves and each other. After cubs leave the den, they learn how to wash in snow and water. 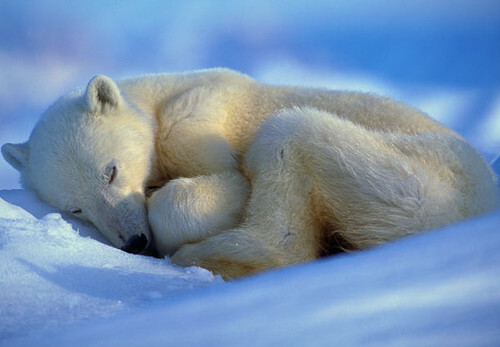 Most polar bears sleep for seven to eight hours at a stretch and they take naps, too. In that way, they're a lot like people. 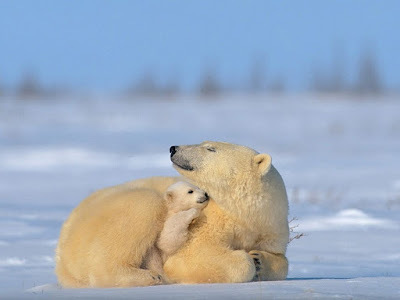 On the ice in spring and summer, polar bears tend to sleep more during the day than at night, probably because seals are more active at night. But day and night hold little meaning in the Arctic where there are 24 hours of daylight in summer and 24 hours of darkness in winter. Polar bears nap just about anywhere and anytime, and especially after feeding on a seal. Napping helps bears conserve energy. A polar bear's entire existence centers on hunting and conserving energy. 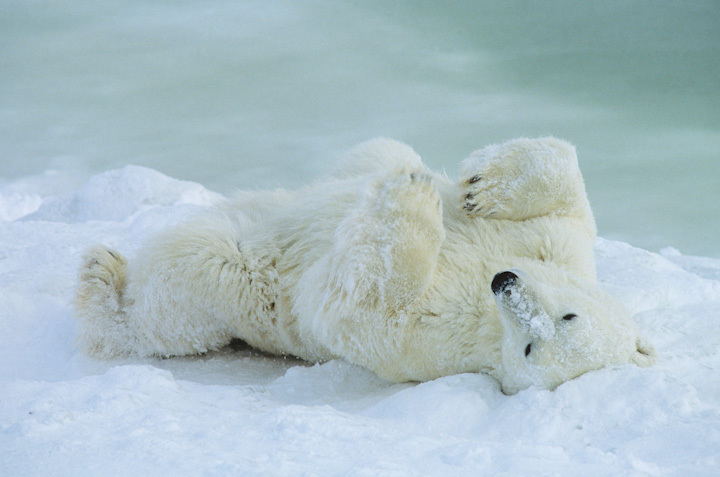 In winter, polar bears sleep in shallow pits they dig in the snow with their sides or backs to the wind. Today, the primary conservation concern for polar bears is habitat loss and reduced access to their primary prey due to climate change, not harvest. Other challenges include increased commercial activities, pollution, disease, inadequate habitat protection and the potential for overharvest in smaller or declining sub-populations. It's been known that polar bears do kill - and sometimes eat - their own kind for some time. But the behaviour appears to be on the increase.